I love ruffles on skirts and dresses. And of course, being pregnant doesn't have to mean that you cannot look cute any longer. However, most maternity clothes I found was either not so cute or overpriced and sometimes even BOTH. OK, time to bring out the sewing machine. I used about 1 yard of main fabric and 1/2 yard for ruffles and belly band. Measure hips, add 2 inches (5 cm) and use this as your width for the pattern. In my case, I ended up at 38 inches. Then I decided on the length of my skirt. I wanted it to reach to my knees, so I had my length: 20 inches. 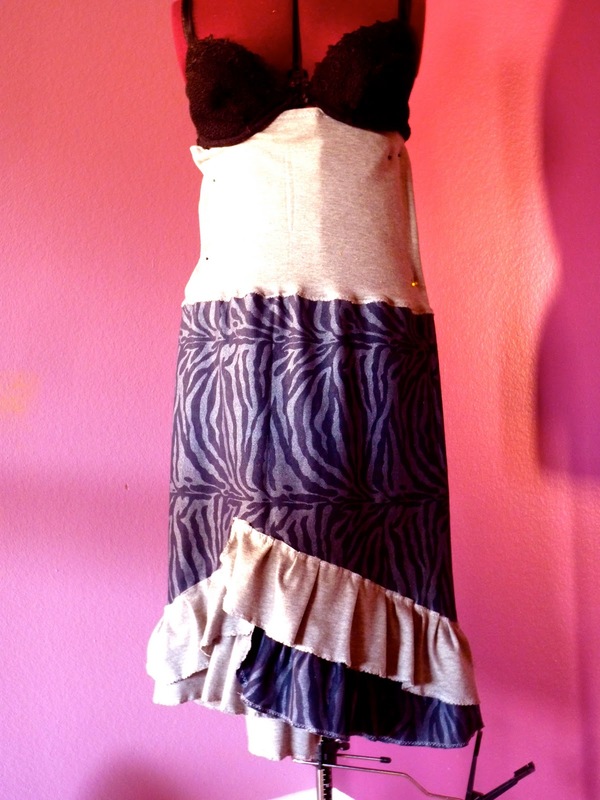 Then I cut that piece of fabric for the main skirt piece; mine is a jeans colored animal print. I know, it sounds wild but the fabric is actually pretty toned down and subtle. But then again, being pregnant is kind of a wild ride, isn't it?! Since we will make this a maternity skirt, I also cut the piece for the 'belly band', which I also used a stretchy fabric but a different one. I used some jersey knit in grey and cut it according to my waist measurement 24 inches in length and I typically make them 24 inches in height as well. I started with the belly band and pressed about 1/2 inch (1cm) inward on both width ends. Then I pressed the piece in half with wrong sides facing. The fold that you get is the top portion of the belly band. The openings with the two little folds need to be sewn onto the main skirt; kinda like bias taping. I used zig-zag stitch throughout since I find this easier for stretchy materials. 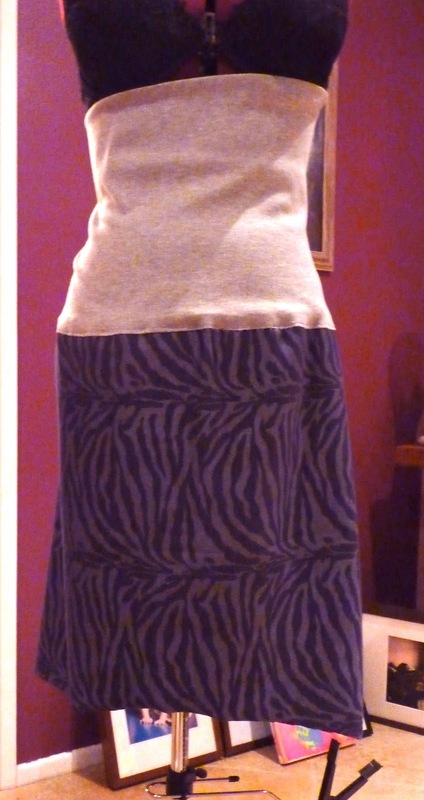 So, I pinned and sewed the grey belly band onto the main skirt piece. I recommend to start with the inside and then lay the outside over the visible seam on the main piece's. From the outside it should look like this. Then I closed the seam in the back, making it a tube. I pinned the piece onto the mannequin, so you can see where you should be at right now. To give it somewhat more of the Flamenco look I curved the bottom end a little bit. NOTE: Only a little, because my big belly will ride this skirt up anyways and I don't want to flash anyone. Now, off to some serious ruffles. For that, I cut strips of 4 inches in height and 1.5 times the length as my width for the skirt was. Then, I pinned the first ruffle right sides facing onto the end of the skirt (where the knees will be). SEW. Then simply keep cutting strips of 4 inches in height and add them. As you can see, I started to bring them in from the sides into the middle to pronounce the cut curve. I also added a small piece of the main fabric for interest.